Once Maggie had the recipe figured out, I stopped in to take a few pics. This recipe will make 20 sandwich cookies, give or take. Ingredients include: 8 ounces Cinnamon Cardamom Ginger Banner Butter at room temp; 3/4 cup granulated sugar; 1/2 teaspoon salt; 1 large egg yolk; 1 teaspoon good quality vanilla extract; 1 cup all purpose flour. First, combine butter, sugar and salt in mixer on low until everything is incorporated. Add the egg yolk, followed by vanilla, on low until well mixed. Remove the dough and wrap in plastic wrap. Refrigerate the dough for at least 30 minutes then bring chilled dough out to a lightly floured rolling table and roll to 1/2" thickness. Using a round cutter, cut 12, 3" circles from rolled cookie dough. Cut a small home from the center of half of the circles. Place all the circles evenly on a parchment covered sheet pan and bake @350 for 18-22 minutes. Once very lightly browned, remove and allow to cool completely. Once cooled, spread a non-holed based cookie with your favorite jam. Maggie chose her handmade FROG jam which is a mix of fig, raspberry, orange and ginger (handmade jam is always best). Top with a 'holed' cookie then lightly press together. My niece and I also tried Banner Butter's Cinnamon, Cardamom and Ginger, which goes great with regular coffee as well as Pumpkin Spice coffee- perfect for a chilly, fall day. A sucker for flavored anything, I loved this creamy, spiced version the best. Thirdly, we tried a mocha version using locally made Atlanta chocolate, Xocolatl. We melted a couple tablespoons in a double broiler, added that into the blender along with the coffee, butter and coconut oil, then drizzled some extra melted chocolate atop our finished cup. 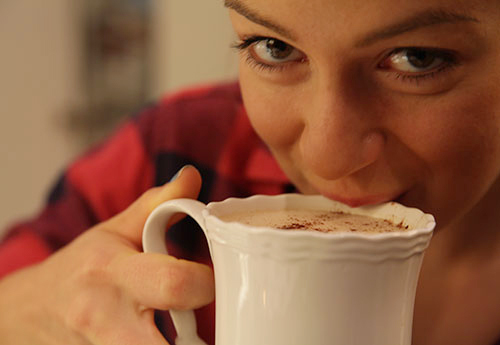 Ultimately, I'm not sure if I had any more energy or brainpower than a normal cup would provide, but I did feel satiated and I did love the taste...especially when there was melted chocolate on top. If you're in Atlanta and wish to buy a cup rather than make your own, stop by Caveman Coffee, on the BeltLine, which is offering two versions right now: Butter Coffee (with unsalted Banner Butter) and Autumn Spice Butter Coffee (with Cinnamon, Cardamom, Ginger Banner Butter, maple syrup, vanilla and almond milk) Yum. My love for butter has evolved because I never knew what I was missing. Our popular American versions pale in comparison to how its been done for centuries in Europe. At Banner Butter, based in Doraville, Georgia, a talented team is creating quite the buzz by getting back to basics and crafting small batch, cultured butter. They are just one of a few retail cultured butter companies in the whole country. As owner Elizabeth McBath explained, "Sweet cream butter (your standard grocery store variety) is pasteurized and immediately churned to kill both good and bad bacteria. Cultured butter is left to sit before churning so good bacteria grows and adds that rich butter taste. The butter you're used to eating, they artificially add that butter flavor back in." Elizabeth, along with her husband Drew, hired executive pastry chef, Kat King to help them develop their recipes. They now focus on three compound flavors, plus a lightly salted, sea salt and unsalted butter, then of course, seasonal compound varieties for when the inspiration strikes. Like the day of my visit when Mary Ellen Yupari, the Manager of Operations, just so happened to be trying out a new seasonal flavor of Georgia peach with local, organic honey, cinnamon and sugar. It smelled divine. I picked up the final result at the Grant Park Farmer's Market a few days ago and I have to say, although I may be partial, this is my new favorite. Chefs, Catherine Weaver and Jennifer Weissman work beautifully as a team mixing, churning, washing, molding, weighing and packing Banner Butter rounds. They love working with cultured butter and talking about their process. It really makes a difference when you know your food is crafted with this much care and passion. 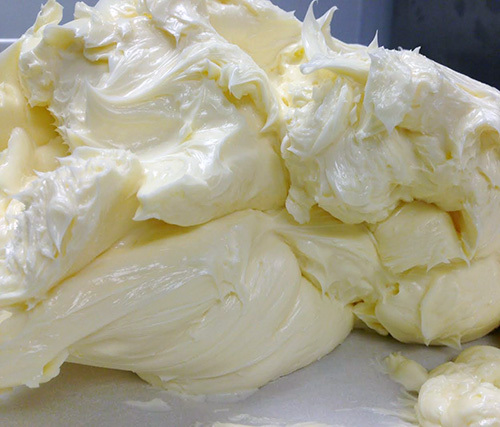 Cultured butter is so creamy and tasty, you often find yourself eating it like frosting from a cake. Elizabeth and Drew source their cream from Southern Swiss Dairy Farm in Georgia- from cows that are hormone free and grass fed. Each small batch at Banner takes 20 hours to make. It's a labor of love- can't you just tell? Elizabeth is passionate about her butter and the way she works with her staff (whom adore her) lets me know even bigger and better things are on the horizon. Both her and Drew have found a new passion through their foray into the food world which has received rave reviews and incredible support. Elizabeth, "I feel more connected to community. We're making something really traditional and it grounds you in a special, beautiful way." Oh butter, who knew our love could get this good? Check out the Banner Butter site to learn more and follow their ever so lovely Instagram account, produced by Ruthie Weil.